The crowd leaving Luxembourg Gardens when the gardens were evacuated late August because some VIP had to be there. I’m happy with the limited tones in this piece. Tell me what you think. Today editing feels like this. Do you ever feel like you’ll never finish? Writing is a passion, my hobby. Some days I want to write all day. When I do, I miss painting and feel guilty, because painting is my workhorse. I’m an unpublished writer and a query virgin. I’ve been writing for years. Everyday I read editor and writer blogs. I wrote three memoirs and put them in a drawer. Each time I was finished, I told myself I’d never write again. Then I started writing flash fiction. Now I’m finishing a suspense called White Sky of Paris. I’ll tell you more about the 400 page manuscript soon enough, when I start to query it. Last month I took Angela James’s Before You Hit Send on-line self-editing workshop. She’s the editorial director of Harlequin’s Carina Press. In the course, Angela offers over thirty info-packed lessons starting from the basics. The lessons build up from basic tricks in microsoft Word to formatting, grammar, dialog tags, POV, author voice and a lot more. Anyone who wants to write better fiction will benefit from her course. What’s great is that you can work at your own speed and it’s very reasonably priced. I love the way she presents the course. Not as rules for writers but things to keep in mind while writing. Clearly, those suggestions are from a queen of editing experience. One thing Angela said about editing a book is that it shouldn’t take years. I learned so much from her course, and how to apply it to my writing, that now the snowball I’m pushing is going somewhere and it’s not getting bigger. A video of me painting Eastward Bound. This painting is available at Paris Art Web gallery in Honfleur. To celebrate the first post on my brand new blog incorporated into my brand new wordpress website, I’m posting one of my all time favorite paintings. I don’t know who bought the Oliera e Limone or what country it went to. 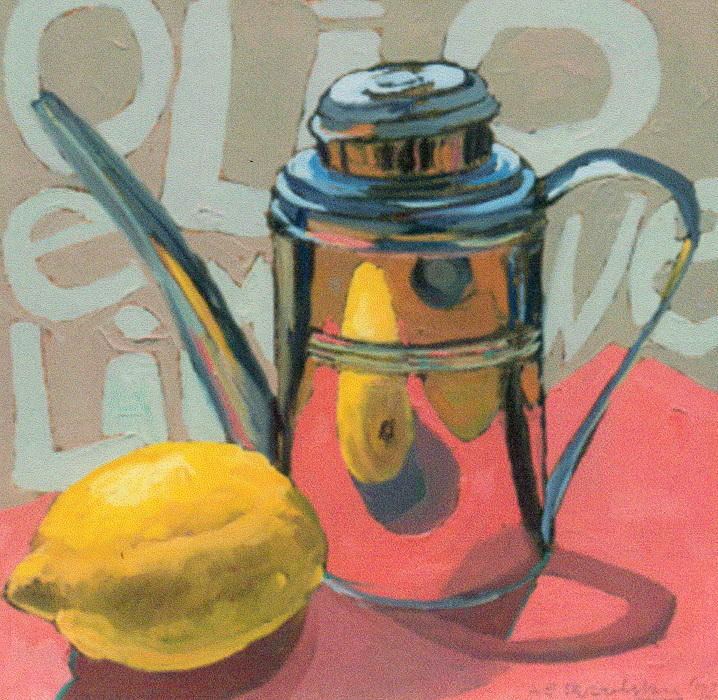 I sold it years ago when I had my studio gallery in Florence, Italy. The Italian food series was lots of fun. They sold faster than I could paint them. At the time, I called them kitchen paintings.